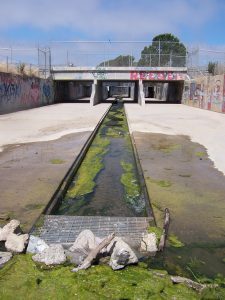 Beginning around the early 1800’s with the onset of large-scale human colonization of the Bay Area, streams have suffered from various forms of ecological degradation resulting in destruction of habitat and reduced ecological function. 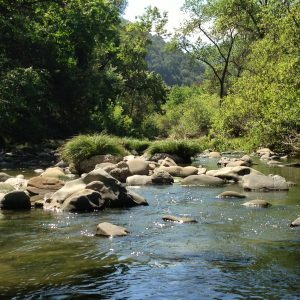 Statewide, around 95% of native riparian habitat is estimated to have been lost, and Bay Area streams are no exception. Urbanization, culverting and channelizing, pollution, and habitat removal have severely reduced the ability of these streams to provide their native functions: conveyance of water and sediment, purification of air and water, nutrient cycling, and habitat for a vast majority of the state’s native wildlife. The habitats that remain are severely degraded, suffering from biodiversity loss and reduced ecological function. Because riparian habitats are so important to such a great majority of the state’s wildlife, restoration of these habitats is critical even in urbanized areas with high human populations. Studies have shown that urban streams, while impossible to return to pristine condition, can be restored to regain many of their native functions. Urban restoration sites are recolonized by many species, including insects, birds, fish, and even reptiles. A study led by UCC is 2009 found that birds considered rare in urban habitats have been detected using restored riparian habitats in urbanized landscapes. But riparian restoration is not only beneficial to wildlife. Studies have found that biodiversity increases well-being and cognitive function in people. This is especially true for the developing brains of children. Children learn better in complex landscapes, and nature therapy is commonly prescribed for learning disabilities. Urban natural areas provide children the opportunity to “learn by doing” by interacting with information-rich, biologically complex living structures. Natural habitats benefit adults, too: they provide opportunities for active and passive recreation, and respite from the stresses of urban life.